With some sound proofing foam, and a decent computer, you can turn almost any space into a recording studio. You won’t even need to tear down walls, although it might be helpful to install a different kind of door. If you want to go all out, it’s worth looking into the density of various woods, and how well they contribute to soundproofing. For the average podcaster on a budget, these tips will work well. We’ll also discuss some other ideas on where you might improve and spend some money. Acoustic foam panels are the most cost effective method to soundproof a small space. You could fill your walls with insulation, but that could be quite pricey. It’s up to you how professional you want to get, and some audiophiles really care deeply about purity. The reason acoustic foam makes sense for most podcasters is that it’s the single most affordable way to bump up the quality of your sound. It reduces echo, and provides a cleaner space for recording sound. 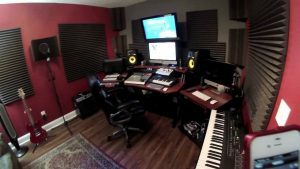 You need a space large enough to sit, and to fit a small table full of some recording equipment. In the early stages, you’ll need a large enough space for a laptop computer and a decent mic. For most people, a small closet will do. You’ll want to replace the sliding doors on most closets, however, since they probably have very thin doors. It’s also helpful if the room you choose is carpeted, but not necessary. You can lay down soundproofing cloth on the floor if you’re not using a carpeted space. Basic recording equipment in the beginning of your podcasting career consists of little more than a laptop and an external microphone. There are some microphones made specifically for podcasting that are under $200. The most important thing is that you get a microphone designed to record sound from a close range, otherwise you’ll pick up sounds like a squeaking chair. It’s also helpful to use multi-directional microphones, especially if you plan to have guests come to your space and record. Which software you choose for editing is just as important as any other consideration, and you should have an idea of the program you’ll edit with before you buy your microphone. For first timers, Audacity is an excellent and free program you can use to record and edit audio. You can mix tracks too, in case you want to write and produce your own music for the podcast. The Foam Factory, Inc. is Southeast Michigan’s largest supplier of consumer foam products, including sound proofing foam.